The Zuni, like other Pueblo peoples, are believed to be the descendants of the Ancient Pueblo Peoples who lived in the deserts of New Mexico, Arizona, Southern Colorado and Utah for centuries. Archaeological evidence shows they have lived in their present location for about 1,300 years. Spanish explorers first encountered Zuni Pueblo in 1540, during their search for the legendary Seven Golden Cities of Cíbola. Instead of gold, however, there’s an abundance of precious turquoise and silver to be found in the pueblo. 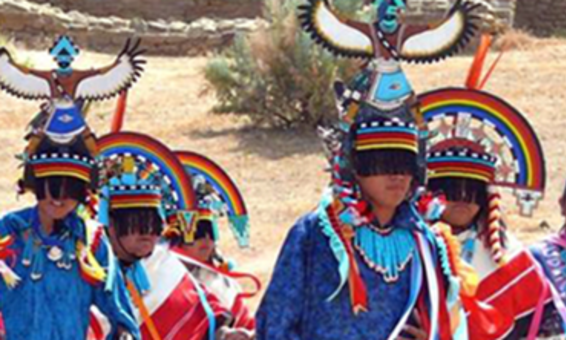 A tribal count places Zuni's population at more than 10,000, making it one of New Mexico’s most populated pueblos. The Zuni people are famous for mosaic patterned, inlay jewelry, needlework and fetish stone carving, which can be found in shops throughout the Southwest. The Zuni community features a variety of shopping and dining facilities, plus service and convenience stores. Ten shops within the community sell Native American arts and crafts. Our Lady of Guadalupe mission church, which was constructed beginning in 1629, can be visited during limited hours. Inside, life-size murals of kachinas are painted on the walls of the church.